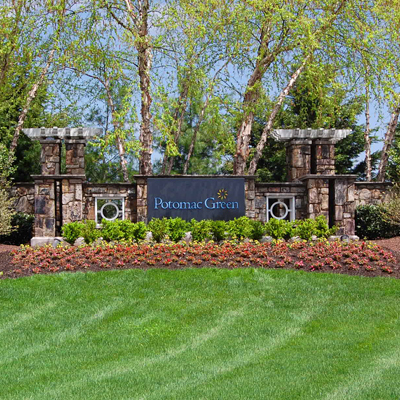 Potomac Green is a premier 55 and older community in Ashburn, Virginia. Located just 30 miles from Washington DC in Loudoun County, an area renowned for its quaint villages, wineries and beautiful horse country. It is only ten miles from Dulles Airport and under two miles from a variety of shopping and dining opportunities. Potomac Green is an ideal place to meet new friends, enjoy your favorite hobbies, and discover new interests. The clubhouse is constantly abuzz with activity and residents frequently head out together to take advantage of abundant local restaurants and recreational opportunities. One of the best things about living in Potomac Green is you can relax knowing your community will keep on looking as beautiful as the day you first saw it. The Homeowners Association (HOA) dues help pay for maintaining your community’s common areas and amenities. Not only does that help protect your property values, it ensures you’ll always be proud to call Potomac Green your home. Items covered by the HOA include: Lawn Maintenance, Lawn Irrigation, Pool and Clubhouse Expenses, Management Fees, Common Area Insurance (Master Condo Policy), General Administrative Expenses & Common Utilities (Water, Sewer, Trash and Snow Removal). There is bus stop at the Community Center that is located on the Ashburn Farm Route. This connects residents to a number of other transit services that are available as part of the Virginia Regional Transit system.